(March 18, 2002) -- LB Airport has announced that its main diagonal runway (30/12) will be closed from 10:00 p.m. to 6:15 a.m. Tuesday, March 19 through Thursday, March 21 because personnel and equipment will be working adjacent to the runway. That means larger planes could be diverted onto Runway 25R/7L, a shorter, neighborhood runway (aligned roughly with Monlaco Rd. to the east and 36st St. to the west) usually used by smaller private planes and commuter flights. Runway 25R usually doesn't operate from 10 p.m. to 6 a.m. (meaning it should produce 0 dB noise in those hours) but can be used as an alternative (directed by the FAA) when the Airport closes its longer, main diagonal Runway 30/12. When that happened last summer, two incoming flights at roughly 10:40 p.m. produced noise on LB Airport's monitors at levels perceivable as roughly twice as loud as allowed for that hour on the main diagonal runway 30/12. When main runway 30/12 was temporarily closed June 26-29, 2001 from 10 p.m. to 6:15 a.m. for adjacent construction, two landings resulted on runway 25R, sending jets over rooftops in the South of Conant area at roughly 10:40 p.m. (June 28 event in photo below). 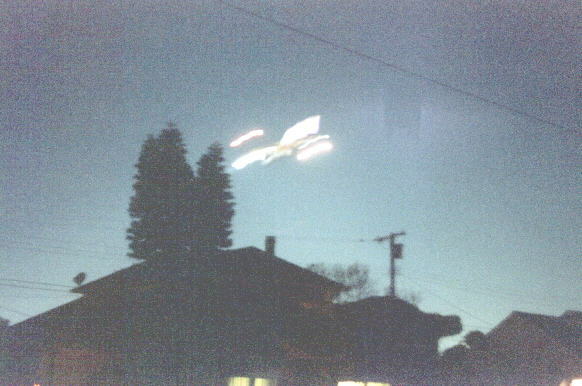 June 28, 2001, 10:40 p.m. Sequential exposure photos (viewed right to left) show Boeing 757 jet charter descending ELB homes on approach to neighborhood Runway 25R when main runway 30/12 was closed. LB Airport staff told LBReport.com that LB's noise ordinance permits an exemption from usual violation standards when flights are diverted onto 25R/7L when runway 30/12 is unavailable. But what about the fact that LB Airport's own monitors recorded noise levels for 25R/7L even higher than allowed for 30/12 at those hours (see below)? LB Airport noise monitoring staffer Dennis Rambo told LBReport.com that monitoring sites for longer runway 30/12 and shorter runway 25R/7L are at different distances from their respective runways, which means direct comparison of their noise readings may be problematic. Mr. Rambo indicated that because readings from the two runways' monitoring sites are not identical distance measurements, City Hall is more inclined to pursue corrective action when the case involves an clearly egregious noise violation (so clear that it will overcome claims that the two readings are no comparable) or a repetitive violation (or both). The two 25R landings registered 98.1 and 100.4 dB SENEL (details below) on 25R's noise monitor at roughly 10:40 p.m. The maximum allowable level under LB's Airport noise ordinance as measured on 30/12's noise monitor at that hour is 90 dB SENEL. LB's noise ordinance allows Airport management to pursue "alternative enforcement" procedures when appropriate in noise cases -- and it did so in two of June, 2001 cases. In one case, Airport management referred the matter (which involved an early morning takeoff) to the City Prosecutor's office. That case escalated to a formal meeting in the City Prosecutor's office that produced de facto "office probation; if further violations occur, formal criminal charges could result. (There have been no further violations from that operator. LB Airport staff told us). One of the 25R landings (June 26/01, 98.1 dB SENEL) triggered the sending of an "alternative enforcement" letter. 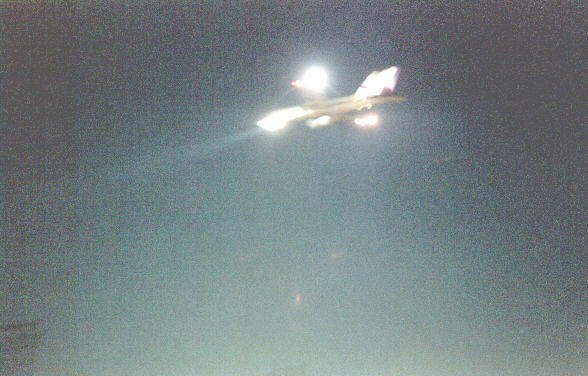 Two days later, another 25R landing (photo above) by another operator (June 28/01, 100.2 dB SENEL) did not produce an alternative enforcement letter, but there have been no subsequent violations by either operator, LB Airport staff told LBReport.com. Although nighttime and early a.m. operations are not common on runway 25R, they do occasionally occur in response to weather conditions, safety factors and the like, which are directed by the FAA. However, monitored noise levels alone are not determinative. Airport Manager Chris Kunze has previously told LBReport.com he will review the histories and facts of each of the noise events and will pursue the alternative enforcement if he believes it is warranted under the circumstances of each flight. Last fall, Mr. Kunze told LBReport.com that depending on the circumstances and history of the specific flight, correspondence might precede prosecution. If the Airport Manager refers a matter for possible prosecution, the decision on whether to proceed with a criminal filing is made by the City Prosecutor's office. An attorney in the City Prosecutor's office familiar with such litigation told LBReport.com that while the office's goal is compliance, it is fully prepared to file criminal charges when that's believed indicated under the circumstances.